5 bedroom beachside tropical villa with open air living and large infinity pool just steps from the Andaman Sea in Kamala. 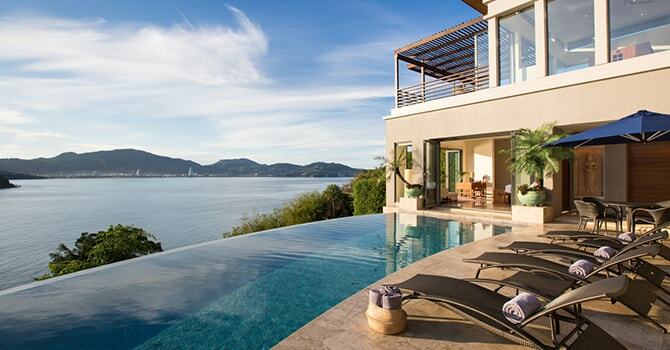 The Aquila is a super villa, a sprawling oceanfront estate of 8 bedrooms and all the facilities imaginable, located on private cove in Kamala. One of the “Great Homes of the World” by New York Times, Villa Fah Sai was designed by the famous American Architect Frank Lloyd Wright. 4 bedroom luxury villa with large grounds, 3 pools, great facilities and serene views of the Andaman sea throughout the pavillions. 7 bedroom Thai-designed hillside property, with lovely garden, terraces, infinity pool & outdoor seating sala, overlooking the jungle and beaches of Kamala. Although Phuket may have a reputation for its bustling nightlife, there are also a number of places to get away from the hustle and bustle and just soak in the charms of this tropical island. One of these places is Kamala. Those who stay in kamala villas or perhaps venture down for a daytrip are drawn to the relaxed and informal atmosphere of this Thai fishing village. 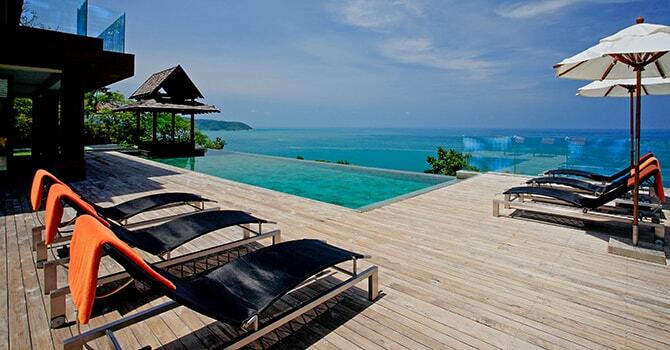 Kamala is located to the north of Patong, in western Phuket. 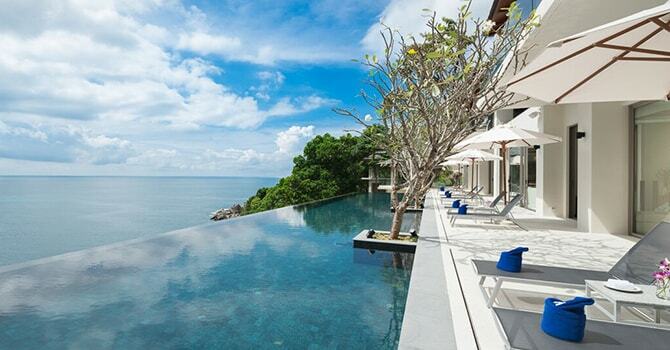 It's location is convenient from the main airport in Phuket; the drive takes just 35 minutes. Kamala is compact in size, so for those staying in a villa, it is easy to explore the area on foot - no need to worry about booking a car or booking taxis, although they are available if you'd prefer. While the popularity of Kamala has increased in recent years with the launch of the popular Cafe Del Mar beach club, it retains much of its understated charm. The center point of beautiful Kamala is Kamala Beach, which is a calm bay flanked by lush forest - making it the quintessential example of a beautiful Thai island landscape. The bay curves gently, creating a calm azure inlet that is surrounded by soft white sand. Kamala is a great location for families, when other beaches are experiencing rough seas, Kamala Beach is typically calm, especially to the northern end. As Kamala has not experienced the intense development of some other areas, it is possible to find Kamala villas for rent which feature beach access or are just a stone's throw from the calm waters. Many of these tastefully blend in with the surrounds, and feature beautiful Thai architecture, adding to the authentic charm. Although it is the quietness that draws most people to the area, there are restaurants, shops and other amenities to enjoy. A former fishing village, Kamala has a great selection of restaurants where you can dine on fresh and delicious seafood delights. Of course, you'll also be able to find Thai favourites such as green curry, or Western fare. Relaxing is the main activity in Kamala, and there are many massage spas where you can enjoy a blissful time. If you'd prefer a relaxing therapy in privacy, it is easy to organise a massage in your hotel or luxury Kamala villa. There is a small 'town centre' that runs parallel from the beach. There are a selection of restaurants and bars, as well as several shops where you can pick up some souvenirs of your time here. Several tailors operate in this area, who can craft clothing for you within a few days. 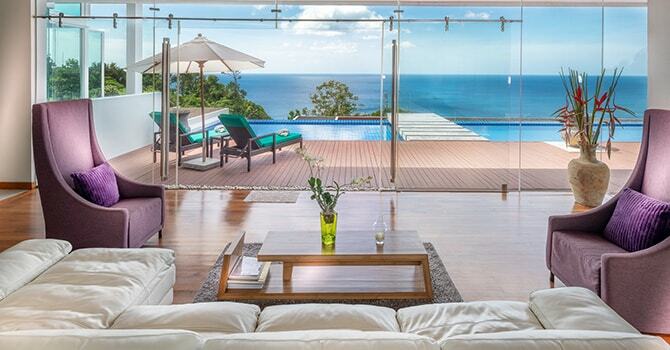 A big part of Kamala's charm is that it has not experienced the rapid development of some other parts of Phuket. As such, there is a little less choice for accommodation, but it is certainly no less comfortable. 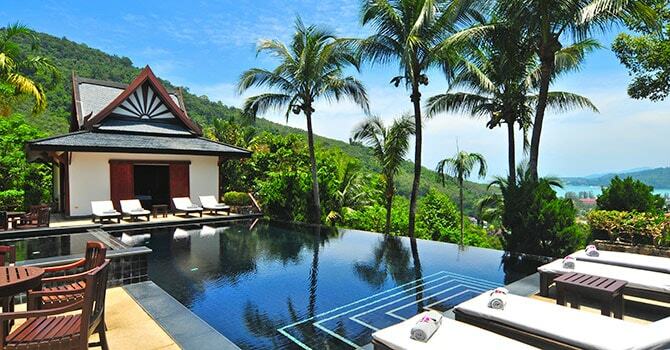 There are many excellent Kamala villas available, which give guests privacy as well as convenience. Once the sun goes down, there are a few good bars and the popular Beach Club. Here, you can easily enjoy a few cocktails as well as some great tunes. If you prefer, Kamala is just a ten-minute taxi ride from the bustling heart of the island, where you can dance the night away before returning to your villa for a peaceful night's sleep. Sleep off any remnants of the previous night's festivities on the beautiful beach, or perhaps pick up a snorkel and do some exploring of the ocean floor. Life is slow and friendly in Kamala, so there is no need to worry about anything except what delicious meal you'll have for lunch. For children, Kamala is also near to FantaSea, a place that has been described as the Disneyland of South East Asia due to its shows and attractions. There is also a beautiful Buddhist temple here to explore. All in all, if you are looking for a relaxing and informal beach retreat that is peaceful and quiet yet within easy striking distance of Phuket's bustling hubs, Kamala is well worth considering. For more ideas and inspiration, why not look up some beautiful photographs or perhaps browse the listings of Kamala villas for rent.